Toon Boom is an innovative piece of software that allows you to create animation and storyboarding. 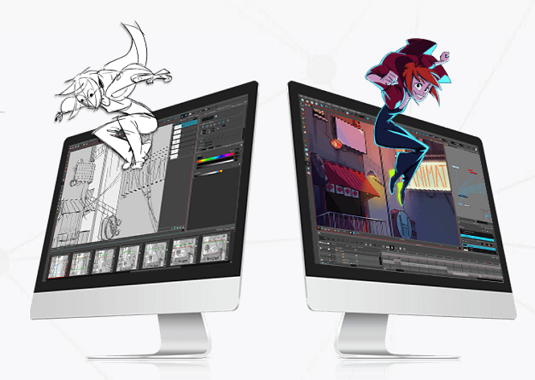 Toon Boom’s software lets you design and create professional, industry-grade graphics. The Canadian-based company has been used by many well-known animation producers such as Disney, Nickelodeon, and Warner Bros. Animation, among others. Toon Boom’s software has all the tools to compose quality animation graphics. Toon Boom has been used to help create animation for some of the most popular TV shows and movies. For example, Family Guy, The Simpsons Movie, Futurama, Curious George, The Lion Guard, and so many more productions have made use of the great features in Toon Boom’s animation software. Harmony: A complete 2D animation solution for everyone from animation enthusiasts to studio animators. This software has been used for projects like Bob’s Burgers. This solution is easy to use and produces professional results. With a full suite of tools, you can perform all kinds of animating functions. Harmony 14, the latest version was released in July 2016. Harmony Essentials Available for $15 per month. Harmony Advanced: This subscription offers more tools for $38 per month. Harmony Premium: The most comprehensive animation software, available for $78 per month. Storyboard Pro: This animating software allows you to creatively tell a story. It is used by many professional studios to develop storylines and utilize multiple creative tools to develop 2D and 3D animation sequences. You can import script, audio, images, and other creative elements to complete a storyline. The full suite of tools is comprehensive and lets you put your artistic talent to use. With a full array of tools and ease of use, Toon Boom can be used by industry professionals, students, and even hobbyists. The options for Toon Boom applications are endless. The software can be used for animated movies, commercials, game development, mobile applications, and more. You can use the tools to freely sketch in characters and scenery. With the ability to add shadow, depth, and movement, you can add as many elements as you choose. The export tools also make it easy to publish your work in different formats to accommodate your individual situation. Toon Boom offers an extensive library of how-to video tutorials to help you make the most of their products. Toon Boom offers support and online forums to assist you with any difficulties you may have with their products. In addition, you can ask questions and receive answers on their online forums. Toon Boom also offers an extensive knowledge base where you can search for troubleshooting tips and find solutions to problems in their searchable database of articles. Toon Boom also offers a showcase where you can post work for the world to see. Check it out for animation ideas or to post something you are especially proud of.